My journey southward on the evening of 2nd April was again shrouded by thick misty fog which had probably affected the photographs of the Angel. The pictures lacked detail giving him an almost eerie appearance. After three hours of driving Daisy and I arrived at the Conkers Camping and Caravanning Club Site in Swadlincote, Derbyshire. The friendly couple who ran the site found us a vacant lot for the night and we settled down for a well earned rest. On the morning of 3rd April I awoke from a deep sleep thinking it was 7 am. Daisy’s Fm radio had not been working well all trip so for once I was not keeping up with the news which was a refreshing change. Then I remembered that I had packed a small portable radio in my case. I switched it on and discovered that I had failed to put my watch an hour forward the previous Sunday which was the start of British Summer Time. Daisy and I had been an hour behind everyone else in England and I had not noticed. The Conkers camping site is in the heart of The National Forest which covers 200 squares miles, embracing some of Staffordshire, Leicestershire and Derbyshire. It is a place to enjoy a variety of activities from forest walks and gentle cycling to horse riding and fishing. It also contains numerous attractions from Calke Abbey, the National Brewery Centre and the National Memorial Arboretum. Unfortunately, I did not feel I had enough time to explore. I had to get Daisy back to Knaphill so I could make her presentable for her owners as I was determined to return her in pristine condition by 10 am the next day. She deserved it as she had served me well. She had no power steering and the stick gear leaver meant that you had to gently shift her through the gears otherwise she easily stalled which happened to us on more than one occasion. But, unlike with modern cars, the effort required to drive her made us bond. My last port of call was at the Oxford Services on the M40 for a much need cool soft drink and a comfort break. 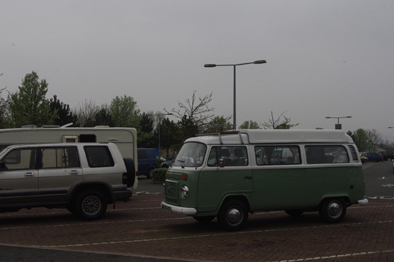 Daisy looked resplendent next to the caravans in the motor home section. 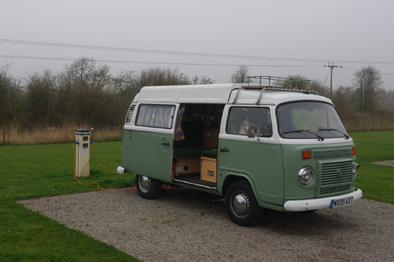 When I finally got her back to Knaphill we had travelled 1527.4 km (almost 950 miles). I spent an enjoyable evening at the Tow Bar watching football on a wide screen TV and dining on their excellent special meaty pizza. The next day I felt the North calling me so I packed up and set off in that direction. My journey was marred by thick misty fog so it was difficult to see where I was going. 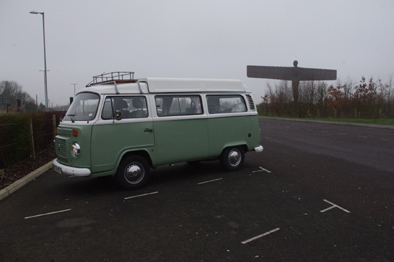 The Satnav took me to a small housing estate in Gateshead in Tyne and Wear, England. and told me that this was my journey’s end. 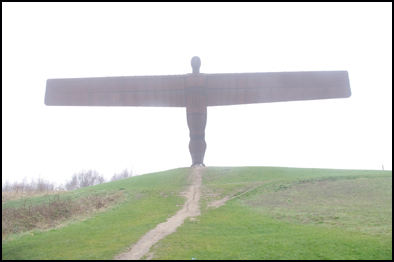 But it was not what I was looking for so I back tracked and there it was, The Angel of the North. This awesome structure was built by the sculptor Antony Gormley in 1988 to signify three things: first that beneath the site of its construction, coal miners had worked for two centuries; second, to grasp the transition from an industrial to information age, and third, to serve as a focus for our evolving hopes and fears. Now I had seen The Angel, it was time to turn round and head southward as Daisy had to be home by 10 am on Friday 4th April. I chose Scarborough because the Association of Veterinary Teachers and Research Workers (AVTRW) met there annually a week before Easter week and I attended regularly towards the end of my career as a veterinary microbiologist. The town held pleasant memories for me. However, when I got there the campsite I had picked from my guidebook which it said would be open turned out to be closed. Fortunately, I remembered that there were a number of other sites on the coast road between Scarborough and Bridlington. So it was with great relieve that I pulled into Brown’s Caravan Park next to The Tow Bar pub. The people were brilliant and so was the beer so I decided to stay an extra night. 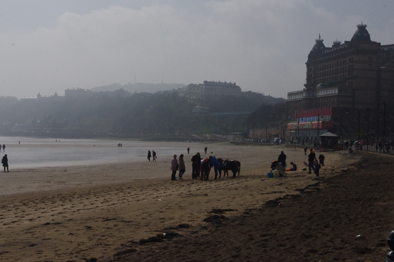 The morning of 1st April I forsook Daisy and caught the local bus into Scarborough to revisit my old haunts. Before leaving I checked the AVTRW website as by rights they should be holding their annual meeting about now. 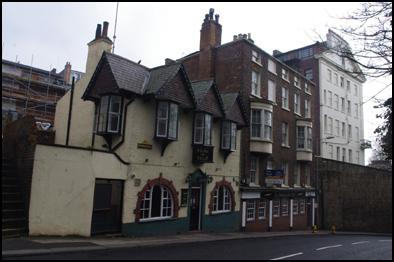 However, it appeared that they had abandoned this historic Yorkshire town for a high tech conference centre at Nottingham University. 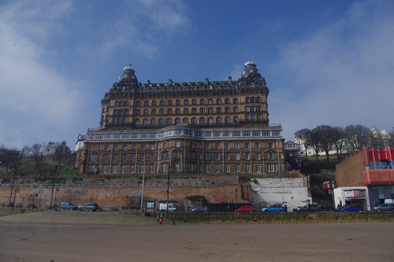 I saw the striking Grand Hotel where I stayed when attending earlier conferences and the Royal Hotel where I stayed in later years. 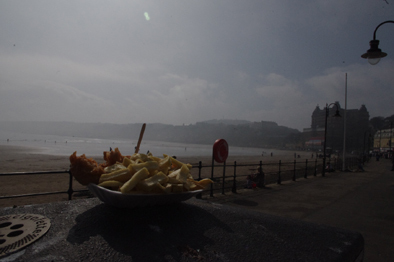 I walked on the beach, watched donkey rides and ate some of the town’s renowned fish and chips. I visited Bonnets chocolate shop where I used to buy my children some of their homemade Easter eggs with their names inscribed on them. Even though they are now adults, I purchased two more. I was dismayed to find that there was a For Sale sign outside one of the old conference drinking haunts, The Hole In The Wall. I called in for a beer and asked the barmaid what draught ales she had on sale. She told me that as trade was always slack at that time of day it was not worth having any on tap but she had bottled beer. The bottled beer they had could be bought anywhere, even from Supermarkets, so I declined her offer. 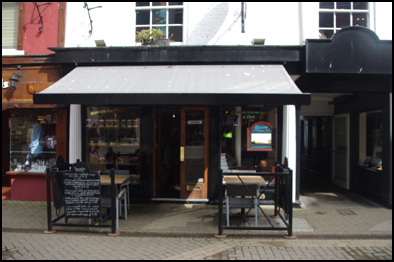 The landlord told me that the brewery was selling the pub as it no longer paid and they did not care if its future was to be as a pub, offices or dwellings as long as the premises were sold for the best possible price. Saddened by the news I caught the bus back to the Caravan site for an afternoon nap. You are currently browsing the Peatmore News blog archives for April, 2014.